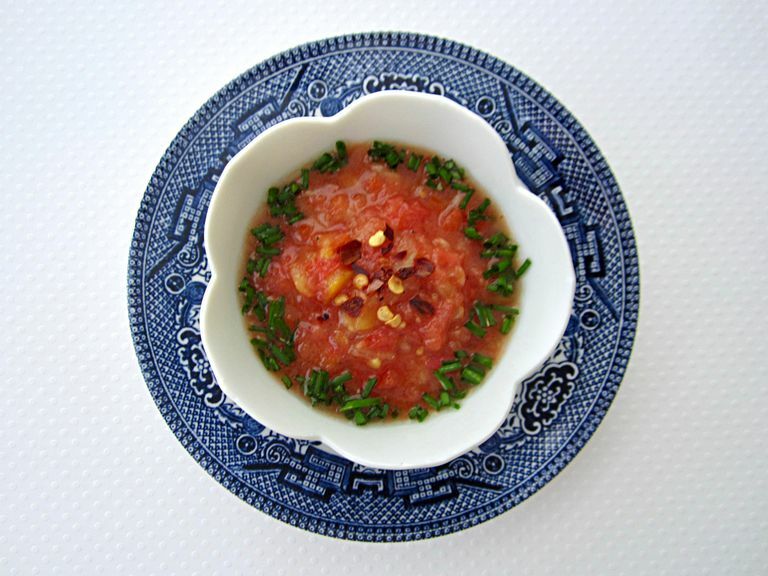 Variations of gazpacho are served all around the world wherever the cuisine has Spanish or Portuguese influences. This version celebrates the flavor of tomatoes, fresh from your garden or the local farmers’ market. It’s just not gazpacho without olive oil. In this IBS-friendly recipe, garlic-infused olive oil does double duty, as it also contributes delicious allium flavor. Garlic bulbs are “out” for low-FODMAP recipes, as they are potent sources of oligosaccharides and typically poorly tolerated by people with IBS. Luckily, oligosaccharides do not pass into oil-based preparations, so garlic-infused oils can be used for flavor. Place tomato juice, tomatoes, vinegar, oil, cucumber, yellow pepper, salt, black pepper, and oregano in the bowl of a blender or food processor in the order indicated. Pulse the blender to puree the vegetables until a smooth texture is achieved. If you prefer a more traditional gazpacho, stop processing when the vegetables are still chunky, ladle into serving bowls, and serve it topped with red pepper flakes and chives. A 28-ounce can of fire-roasted, diced tomatoes can be substituted if fresh tomatoes aren't available. Garlic-infused olive oil is easily purchased; it is sometimes marketed as "dipping oil." Due to commercially available food processing techniques, commercially prepared garlic-infused oil can be stored in the refrigerator after opening. To make your own garlic-infused oil, peel a clove or two of garlic and sauté in a small saucepan or skillet with the required amount of oil. After a few minutes, remove the flesh of the garlic and proceed with the recipe, using the flavored oil. Larger batches of garlic-infused oil can be made but must be used or frozen within four days to prevent food-borne illness.